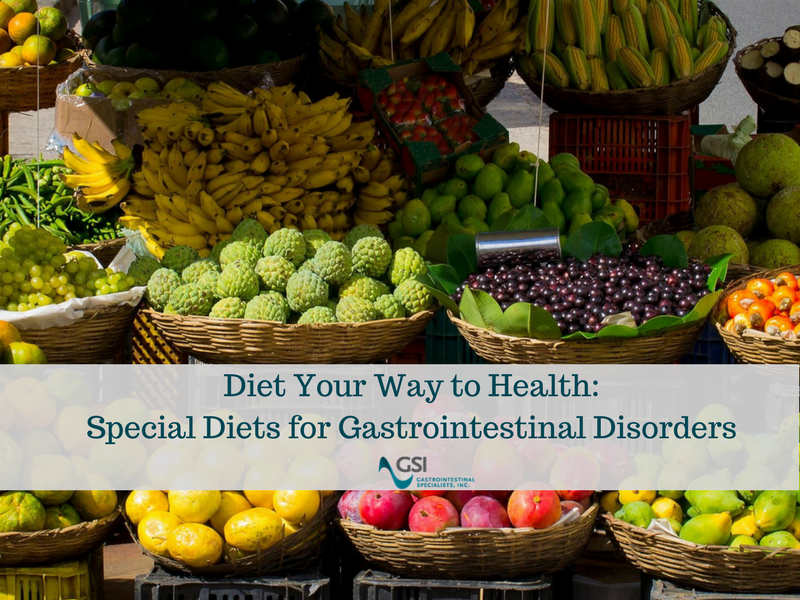 Diet Your Way to Health: Special Diets for Gastrointestinal Disorders | Gastrointestinal Specialists, Inc. The food we eat can have a huge impact on our health – especially our gastrointestinal health. In some cases the food we eat can either cause gastrointestinal disorders, or further aggravate a gastro disorder. Either way, simply changing your diet can help a lot! Here are some diets that can help to alleviate symptoms of gastrointestinal disorders. Because the Low FODMAP diet is such a drastic dietary change, the best way to approach the diet is to slowly phase out foods to see which foods alleviate symptoms most for you. For more information on FODMAPs, go here. Studies have shown that adopting a vegetarian or vegan diet may delay Crohn’s disease remission. Most Crohn’s disease sufferers relapse within two years after remission, but in an experiment where half the participants were told to adopt a plant based diet and half were not, the patients that adopted a plant based diet were less likely to relapse within two years. Fiber helps to bulk your stools, which is especially important when you experience constipation (for more on alleviating constipation, go here). Fiber-rich foods include fruits, vegetables, and grains. However, certain fiber-rich foods can cause bloating, so you may want to focus on increasing your intake of soluble fiber-rich foods, specifically fruits and vegetables, rather than grains. Low residue diets are essentially cutting back on high-fiber foods. Wait a minute, you say, you just said high fiber is good for IBS sufferers! IBS has a wide variety of symptoms, and the solutions vary as well. A low fiber diet could benefit those who experience diarrhea and gassiness, while a high fiber diet helps to alleviate constipation. To alleviate diarrhea and gassiness, try to lower your intake of soluble fiber, found in foods such as oatmeal. Another easy way to cut back on your fiber intake is to peel the skin of fruits and vegetables before eating, as the skin is loaded with fiber. For more on the low residue diet, go here. According to the National Institute of Diabetes and Digestive and Kidney Diseases, one out of every 133 people has celiac disease. For these people, gluten consumption can lead to intestinal damage. Many grains contain gluten, but there are also sources of gluten that you might not expect. Unexpected possible sources of gluten include: chicken broth, soy sauce, malt vinegar, veggie burgers, seasoning mixes, and some salad dressings. Due to the rise in gluten-free diets, there are luckily many substitutions for grains that contain gluten. For more on gluten-free diets, go here. If you believe that you have a gastrointestinal disorder that requires attention, make an appointment today.